The original offices for Indiana Tool were housed in a single story block building at the front of the plant. 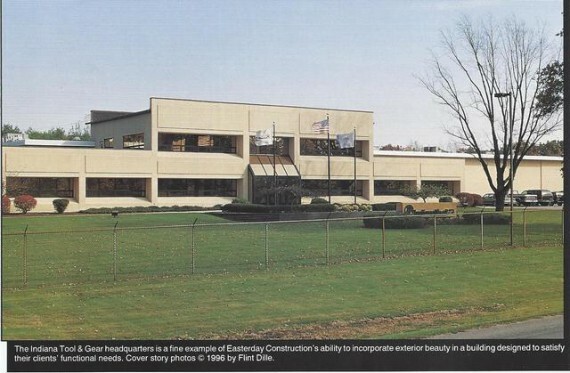 Through collaboration between Scearce & Associates, Easterday Construction Co., Inc. and Mark Neidig at Indiana Tool (Soon to be ITAMCO) the new modern office facility seen above was achieved. This brought the offices into the modern era and gave them a facility fitting to the international clientele the company was expanding to serve. This was completed while keeping the plant and offices operational. We as a Board of Directors have chosen Easterday Construction because they have the same goals as Garden Court. We want a quality facility and Easterday has provided that level of quality. Ronald W Liechty - President, Garden Court, Inc.